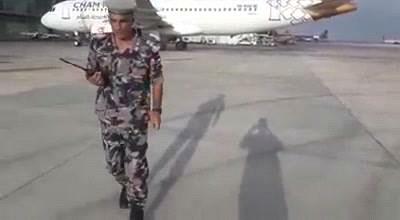 AMMONNEWS - The first civil flight from Damascus to Amman was conducted on Sunday, the Syrian government reported. According to the government report, the the Syrian plane was observed by the Jordanian authorities, who gave the incoming flight the traditional water salute. The water salute is a touching airport tradition to honor military veterans, foreign dignitaries and new airline service. Salutes typically involve two firefighting rigs spraying arcs of water over an arriving or departing flight; it is a sign of respect, honour and gratitude. This is the first civil flight to be conducted between the two neighboring Levantine countries in several years. It comes just weeks after the Syrian government retook the strategic Nassib Crossing along the Jordanian border.